Rabbi Barbara understands that when our dear ones pass on, it can be a sad and difficult time. In addition to bringing closure, a Jewish funeral or a Jewish memorial service can surround thefamily with love and support. The modern pluralistic approach to the Jewish funeral and the Jewish memorial service includes traditional rituals such as the chanting of the beautiful “El Male Rachamim,” along with an explanation in English of this traditional prayer. Family members are encouraged to share their thoughts and memories, however Rabbi Barbara is always ready to meet with families in order to prepare and deliver an appropriate eulogy. It is important to emphasize that synagogue membership and/or attendance is not a requirement for an individual’s Jewish funeral or Jewish memorial service. At both the Jewish funeral service and Jewish memorial service, the Mourner’s Kaddish is recited. Rabbi Barbara provides family members and guests with copies of the prayer in both Hebrew and transliteration so that everyone can participate in this ancient and comforting prayer. As a former special education and psychology professional, Rabbi Barbara is comfortable talking with children and grandchildren about the loss of a sibling, parent or grandparent and provides follow-up materials for families as they move through the grieving process with a young mourner. Whether a family chooses a traditional burial or a cremation, Rabbi Barbara is ready to work with your family to personalize the service and provide your family with a dignified, loving and spiritually appropriate experience. Cremation is considered a valid choice according to modern pluralistic “halakah” (Jewish Law) and if the family desires it, Rabbi Barbara will assist the family in planning a ceremony to scatter the ashes. 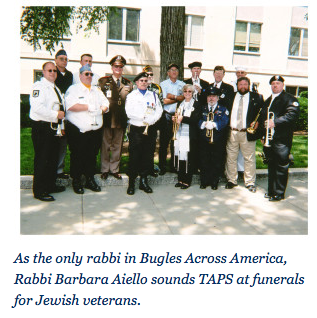 In addition, Rabbi Barbara will design and officiate at the cemetery service for the setting of the head stone or marker and as a member of Bugles Across America she is available for services at veterans’ cemeteries where she will sound TAPS if the family desires. Because Rabbi Barbara divides her time between the US (Florida) and Italy (Calabria) she is available for a family’s Jewish funeral and Jewish memorial service needs in Florida from Rosh HaShanah through Passover and in Italy during the summer months. 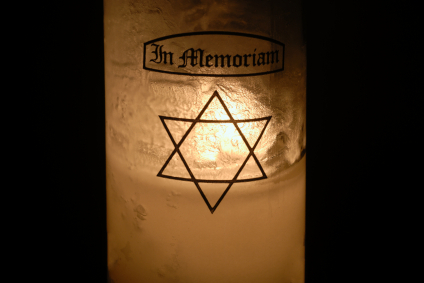 When your Jewish funeral memorial services need arises, please contact Rabbi Barbara directly by telephone (941-306-3255) or Email (Rabbi@RabbiBarbara.com) to make your arrangements. "We thank you for your kindness and caring at our dear father's passing. Your memorial service was warm and personal and brought us great comfort. Thank you again for your beautiful memorial service. We will always remember it."